"When Did Disabled become Handicapped?" When did Disabled become Handicapped? ngram-disabled,handicapped-2, a photo by dnwallace on Flickr. 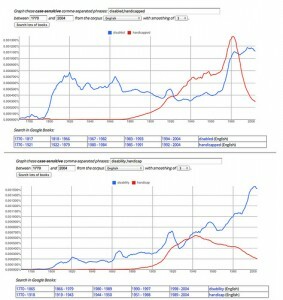 Spurred on by the discovery of Google’s ngram utility whilst reading this post by Doc Searls, I tried a query using the words disabled and handicapped. 1/ What happened around 1920 when disability became overtaken by handicapped. Especially since handicapped was only starting to appear in 1880s, prior to which disability was prevalent. 2/ Was it the passing of the ADA in 1980 and the International Year of Disabled Persons in 1981 that sharply reversed the use of “handicapped”? An observation. Handicapped, the adjective, seemed to have kept increasing while the noun handicap drops away.